The X8R computing server is the perfect turnkey solution for all computing projects demanding highest GPU power and flexible configurability. Our multi-GPU server enables you to optimize your workflow by significantly reducing computing time. X8R is the ideal tool for applications such as financial mathematical analysis, FEM / CFD and molecular dynamic simulations, deep learning, CAD, CAE, prototyping as well as 3D animation, Visual FX, postproduction and physical correct rendering/raytracing. The multi-GPU server is built using production proven enterprise-class components offering outstanding quality and system stability as well as unique expandability for up to eight highend dual slot graphic accelerators for fast computing of complex projects. Available as an option: The dual 10-GBASE interface to quickly transport large amounts of data over network. X8R computing server is the perfect choice for applications like Octane Render, V-Ray RT, FurryBall, Indigo Rendering, Redshift Biased Rendering, Blender Cycles Unbiased Rendering as well as Catia, Solidworks, Ansys, Abaqus Struktur and PTC Creo. As a privileged partner for visual computing solutions, we are in continuous dialog with NVIDIA. This direct communication to their technology, support, sales and product development department, gives us the possibility to receive early in-depth information and hardware samples regarding future NVIDIA technologies. 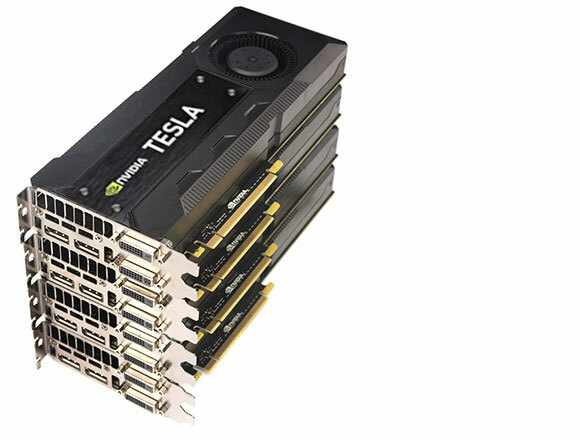 This advantage enables us to test and integrate upcoming NVIDIA technologies into our solutions prior to actual release. 5x PCI-Express, 1x PCI, 2x SATA 6Gb/s, 6x SATA 3Gb/s, 2x eSATA, 2x USB 3.0, 10x USB 2.0 extern, 2x USB 2.0 intern, Gigabit LAN, 8 CH. HD Audio, vollmodulares 80Plus Gold zertifiziertes High-End Netzteil, Slim DVD-Brenner, etc. Hochwertige, robuste 19-Zoll Workstation mit 4 Höheneinheiten, entwickelt für den täglichen Dauereinsatz im Bereich Digital Content Creation. Offizielle Ventuz Technology Zertifizierung. Maximale Leistung, höchste Stabilität und kompromisslose Qualität von Profis für Profis. Installieren Sie bis zu 3 zusätzliche PCIe cards (RAID Controller, Sync-Modul, Video-Boards, professionelle Audio Interfaces, zusätzliche Netzwerkkarten...) sogar im QUAD-Modell mit bereits 4 vorinstallierten Grafikkarten (Länge der zusätzl. Karten ist limitiert). 10x SATA3-RAID (0,1,5,10), 5x USB 3.0 (2x hinten, 2x top panel, 1x onboard port), 4x USB 2.0 (2x hinten, 2x via header) dual Gbit LAN, TPM 1.2 header, Serialport (1x hinten, 1x header), Thunderbolt optional etc. z.B. Dassault Systemes Catia und Solidworks, Siemens PLM, PTC Creo, Autodesk Inventor uvm. z.B. Deep Learning, Finite Elemente Analyse, Physiksimulation, CFD (computational fluid dynamics) für Aerospace, Automotive, Industrial Design, Medical etc. z.B. Automotive und Industrial Design, Data Visualization, Video Walls, hochaufgelöstes High-End Realtime Rendering, Broadcast/TV Realtime Signal/Media Processing etc. z.B. Adobe Creative Cloud (OpenCL™ beschleunigte Effekte), Echtzeit-Stereoscopic 3D, OpenCL™-basierte Render Engines und Plugins, DaVinci Resolve 10 etc. Basis-Gewicht betriebsbereit, aber ohne GPUs und Zusatzoptionen. Jede GPU wiegt ca. 1kg. * individual configurations upon request. prices excl. VAT and shipment. Errors and omissions excepted.